I wholeheartedly agree. Also, moss-green sounds and looks so much better than that other green. But there's a problem. I may have missed something obvious, but I've clicked around at Retrouvius quite a bit now — fascinating site — and can't find this kitchen. Is there another link? 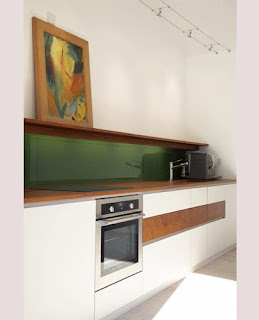 This kitchen is in the Pool House [from the drop-down menu of Design Projects]. Thank you. I thought I had clicked on all of them, but perhaps I was distracted. There's just so much to take in. Jamie Griffith, the architect of the Pool House, and the people at Retrouvius are masters of restraint. The process of making a single thing of modern (or contemporary) and Danish Modern revival is a fascinating one. Usually you just find lonely Danish pieces — poor old Wegner — added to contemporary settings. It makes the backsplash what we used to call Danish Modern Green, an earthy color that found its way into almost every design. Only this time it's been drawn into the decidedly contemporary side, the one high­lighted with bands of ordinary lumber stock, as you pointed out. This is the work of people who really know what they're doing. It seems like an in­con­sequential kitchen at first. In fact, it's only an extra kitchen, and you've posted such extra­ordinary ones, but this one really does it for me. Thanks for sifting out the gems. I picked a couple more Retrouvius projects for future posts. You're right, Evan Jones, their work is quite enjoyable. was it intentional by the designer to juxtapose the oven with the painting? if so, what did she or he mean to say thru this juxtaposition? @Anonymous: I don't know. Do you have an interpretation of this? The painting and the oven are close together and different, but I don't think they are juxtaposed. They are balanced. It's the kind of thing you find in Calder's mobiles. On the left is a large but flat rectangle. Below and a bit to the right is a large but hollow oven. To the far right is a small but heavy espresso machine. Calder does the same thing with large, irregular flat shapes on one side of a long bar and round, heavy balls on the other. The trick is in finding the balance point. I imagine it's somewhere near the sink. The balance point in this case, of course, is only a perceived one. It's a marvelous designer who knows exactly where to place things.